With both the environment and the animals in mind, we like to try out different plant based products. 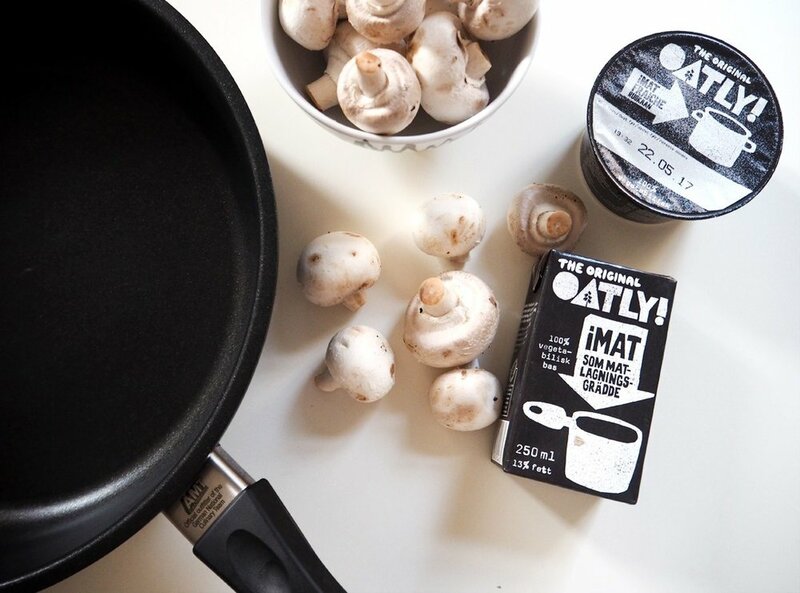 We were therefore very happy to collaborate with Oatly, making dinner the Oatly way! What may that be, you may wonder? The original idea behind Oatly was to find a way to make a nutritious liquid product for people who just didn’t like cow’s milk or were unwilling to use it for personal reasons. Everything they make, they make on Swedish oats. Their goal is to deliver products that have maximum nutritional value and minimal environmental impact. Sound pretty damn awesome to us! So, on today’s menu we have a creamed mushroom and spinach casserole. (Chicken, if desired. Either in the casserole or on the side, but we recommend a vegetarian option). Start by preparing the rice. When it’s boiling, you can start by finally chop the onion and fry in the pan. Then add the chopped mushrooms and let them fry until golden brown. When ready, add 1 pack (250 ml) of Oatly single cream, 2 tbsp. Oatly crème fraiche, the soy- and chili sauce and let it simmer for a few minutes. Then add 2 tbsp. corn flour and whisk well. This is to get a thicker consistency. Lastly add the spinach and stir well. Season with salt and pepper and serve with rice.